This is a picture of a stained glass ornament that was made by my sister, Greta Hanesworth. It is hanging in front of the window in my office where I do my writing. Jesus face looks like he has tears in his eyes, which was an accident that occurred when it was fired in the kiln. The glass was soldered together first and then the face was painted on. The final step was firing it in the kiln. 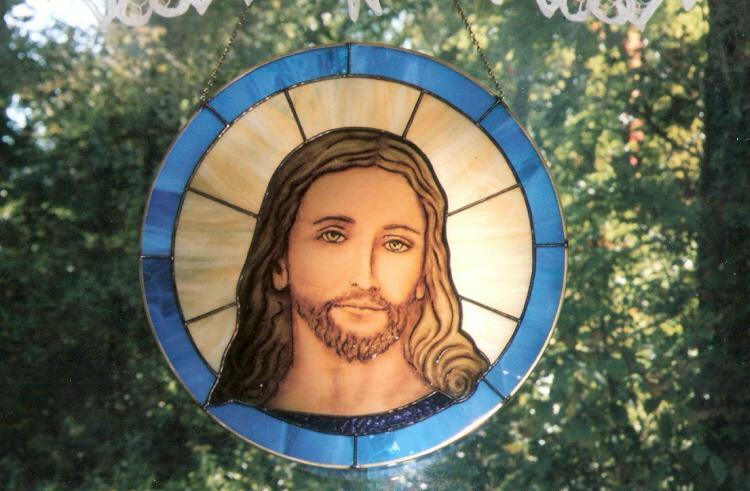 This particular “Face of Jesus” was never used in the full window, which took almost a year to make and was installed in a church in southeastern Ohio. The face sat around alone in the art studio for about a year and then I asked Greta if I could have it. She never said anything until my birthday last year, when she gave me the face with the pretty round frame. It is beautiful and the face of Jesus is very special to me and inspires me often. I wish everyone a Blessed Easter and I hope this picture adds joy and inspiration to your day.